Do you love history but don’t know your own family history? Are you looking to discover where your ancestors came from? Is there a family mystery that you’d like to solve? Would you like to view a photo of an ancestor or a document they signed with their own hand? Did you have a relative who was a war hero? A criminal? Are you descended from royalty? Are you related to a president or celebrity? The History Author Show can help you find answers to these and other questions by searching through census records, vital statistics records, land records, military records, church records, court records, newspapers and more! We specialize in records from America, Canada, Australia, England, Scotland, Wales, France, Germany, Poland and Ireland, but have also collected Italian, Hungarian, Lithuanian, Ukranian, Czech and Jewish records and are continually expanding our research. We compile this research and provide you with an online tree at Ancestry.com. Our family history expert, Catherine Karayanis, is a member in good standing of the Association of Professional Genealogists. She has obtained a Certificate in Genealogical Research from Boston University (GPA 4.0). Catherine is also an author of six books, and has been doing genealogical research for or over 20 years. Her clients have included Americans, Canadians, Australians, and more. a) Upon registration and payment of the Startup Fee, we will email you a questionnaire for you to fill out and return to us with any/all information you know about your family. Full names, birth dates, birth cities, etc. are some of the things we need to start the research. b) You will also receive an emailed copy of our engagement letter for our research services, to which you must reply with your agreement in order for us to begin your family research. c) We get to work to provide you with an accurate and thorough family history. We collect census records, photos, documents, military records, immigration records, newspaper articles, city directory listings and everything we can find about your family. With this information, we construct your family history, discover your famous or not-so-famous relatives, etc. 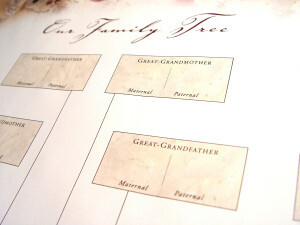 e) At the conclusion of our research, we provide you with a detailed online family tree created from the research. WHAT IF WE CAN’T FIND ANYTHING? There are always “brick walls” that genealogists encounter, where an ancestor’s records have not been kept or have been destroyed, but we will consult with the client, if the goals have not been met and it looks like the family tree is at a dead-end. Chances are, we’ll find more than you expect. Our clients are amazed at how we often can find photos or information about their ancestors that they didn’t know existed. We believe everyone should know their history and we want to help you discover yours at an affordable cost. You don’t have the time to commit to searching through millions of records, so let us do it for you. Prompt responses to any questions, with professional and courteous service. We provide quality, accuracy, privacy, and abide by a code of ethics. We do not share any of your personal family information or contact information. We love our clients! By the end of each family tree project, we know them so well.